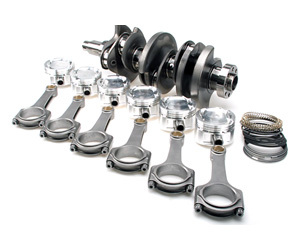 The BC stroker kit for the Nissan VR38DETT engine incorporates a 94.4mm stroke, EN30B steel billet crankshaft. Depending on bore size that you decide, the BC kit will take you up to a 4.45L with a safe 100mm bore. The VR38 kit utilizes premium steel billet connecting rods. As usual, each BC kit features custom CP or JE pistons, wrist pins, and full ring pack. Big time horsepower and torque gains. BC EN30B billet steel crankshaft (94.4mm stroke)... same material used to make 7000+ HP Top Fuel cranks. BC 4340 Pro Series I Beam connecting rods w/top-of-the-line ARP Custom Age 625+ bolts. Upgraded 9310 Series tool steel wrists pins come standard. Available as fully system balanced and ready to install or unbalanced (50% deposit required). Note: ACL Race Series Bearings are NOT included in this kit. Must use OEM/factory bearings for this application. BC VR38DETT crankshafts are made from the finest, aerospace grade EN30B steel billet material. CNC machined on state of the art, 5 axis Mazak Integrex 300-IV CNC machines to exacting tolerances (.0001"). Every crankshaft features large radius journals that add rigidity for high horsepower, high boost, high rpm applications. Gun drilled, CNC ground oil holes feature a smooth surface for extra oiling, tear dropped for added oil scoop, cross drilled for priority main feeding to the rods and micro polished to a mirror finish for optimum bearing lubricity. All cranks are stress relieved, shot peened, magna flux inspected and nitrided (multi step heat treatment) for ultimate performance. Fully profiled counterweights are designed for reduced windage through the crankcase creating less oil resistance for better rpm potential.